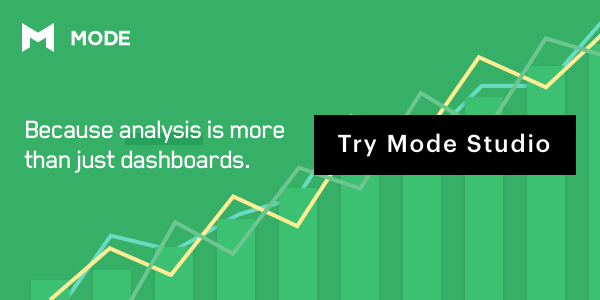 Mode is the data science platform that combines the building blocks of analysis (SQL, Python and R notebooks, and a viz builder) so that you can solve problems, and go beyond just building dashboards. “The right dashboards” are a moving target. No matter how many you build, the requests for dashboards won't stop, and this can lead to less alignment around key metrics. Focus on the consistent core metrics that drive success for your organization. The job of analysts and data scientists is to help people and organizations make better decisions. Your value comes not just from providing data, but also from finding and presenting the story that data tells. If a dashboard is the most common thing you deliver, you can't tell those stories. You forgo the opportunity to be an analyst, and your impact could end the data pull. By focusing on key metrics and storytelling, analytics teams have more time to focus on solving the most interesting problems. Enter Mode: where traditional BI tools often make it easy to build dashboards, Mode makes it easy for you to answer any follow-up questions when you see changes in those dashboards. Choose the level of abstraction you want for a given dataset—from working with raw data to building your own aggregations—and quickly get to the story behind the change.